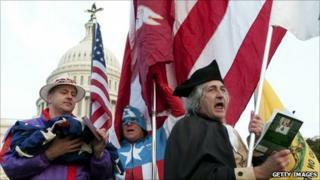 What next for Tea Party after mid-term victories? The low taxes-small government campaign movement known as the Tea Party has helped the Republicans to big gains in the US mid-term elections. But what will this potent, libertarian strand of politics do with its newly-won power? The Tea Party is celebrating after a number of solid victories for its favoured candidates. Rand Paul helped the Republicans to convincingly hold their Senate seat in Kentucky. Nikki Haley won the South Carolina governorship. Marco Rubio triumphed in a three-way fight to become senator for Florida. There were other less heralded winners, but also defeats for Sharron Angle in Nevada, Christine O'Donnell in the Delaware Senate race and Carl Paladino in the New York gubernatorial battle. The overall result for the Tea Party was mixed. Although some races are still undecided, MSNBC calculates that only 32% of Tea Party candidates won. At least 82 Tea Party candidates lost their races, though many of those losses were expected. The question the analysts are wrestling with is where the movement will go next? The looming theme in US politics is the possibility of deadlock, with the Senate still in Democratic hands and the House of Representatives in Republican hands, and with a Democrat in the White House. For the newly-arrived Tea Party-backed legislators, there may be difficult waters to navigate if they actually want to pass laws. There'll reportedly be a meeting of all of them organised by the Tea Party Patriots grouping in the next couple of weeks, and Mr Paul plans something similar. "You need to gain enough clout in the legislature to pass identifiable policies that you can claim credit for," says Prof Wendy Schiller, from Brown University. "But if they pass amorphous Bush tax cuts and cut spending that is not anything the Tea Party can go home and boast about." One major question for the short and medium term is whether the movement should try and retain its character as a loosely-organised, organic, unhierarchical movement, or coalesce into a coherent political grouping with a leader. Sarah Palin has often been identified as a sort of spiritual leader for the movement, but the movement might want something more concrete. "You need a charismatic Tea Party leader," says Prof Schiller. "The conflict is do they stick with Sarah Palin as their charismatic leader when she is not in the Senate or House. "You can stick with an outsider persona or you can find some one in the chamber like Rand Paul who can be your voice in government. The key is making the transition." Mr Paul was already a prominent figure in the Tea Party, before last night's victory. He has said he could form a Tea Party caucus in the Senate and previously identified Jim DeMint and Tom Coburn as people he would be happy to work with. "You need someone who is articulate, good-looking and can raise money," says Prof Schiller. "The Senate is an amazing forum for individuals to make their own reputations." But for a movement that has been so insurrectionist, with the slogan "take back Washington", there is a difficulty if they are drawn into the negotiation, compromise and trade-offs that characterise law-making in the capital. "If you run on hating the government and become the government, it is hard to not be hated," says Jill Lepore, American historian, New Yorker writer and author of The Whites of Their Eyes: The Tea Party's Revolution and the Battle over American History. "There is going to be disappointment among the supporters. They won't be able to do what they promised to do." To take one policy, the extension of the Bush-era tax cuts, which will lapse on 1 January, deadlock could still continue. President Obama wants to extend them for those with an income up to $200,000, while the Republicans want them extended for everybody. "They [Tea Party supporters] are going to be looking for pretty quick answers," says Kate Zernike, author of Boiling Mad: Inside Tea Party America. "They want a balanced budgets but they want taxes to be cut. "This is a movement that has expressed scepticism for some of the messier compromises, but that's how laws are made." Writing in the Wall Street Journal, Senator DeMint urged Tea Party-supported candidates to stick to the principles that had got them to Washington. "Put on your boxing gloves. The fight begins today," he wrote. What the Tea Party will be able to deliver is inaction, Prof Lepore says. They can loudly shoot down every measure that their supporters would want shot down. But that might not always endear them to the Republican establishment. "Members of the Tea Party really see themselves as Conservatives rather than partisans," says Prof Jay Barth, of Hendrix College. "They won't be thinking about what is best for the party. That is going to be a real challenge." There might even be a shift in the rhetoric of the Tea Party - perhaps a little bit less 1773 (the year of the famous Boston Tea Party) and a little more 1787 (the year the constitution was drawn up). "When the movement began it was all about insurrection and revolution," says Prof Lepore. "In the last phase it's been more about constitutionalism." Exactly how the movement fits into the wider Republican Party in office is likely to prove a big political story for the next two years. "There will be a conflict within the Republican Party," says Prof Schiller.